Those bananas get me every time. I have an affection for bananas that most sane people reject–call it freckle empathy–and having them around but trying not to a) eat or b) bake jacked-up banana bread with them is torture. To put it another way: I feel like the chimpanzee in this video and the bananas? They never win. So, how was it? Unbearably good. But it was almost unbearably sweet as well. In hindsight, I’m not sure this cake needs caramel on top to make it good, as boring as that makes me sound. The sweetness of the lid nearly overwhelmed it, requiring a two glass of water chaser. It also hardened quite a bit, making it impossible to break through it with the side of a fork and meaning it gets totally stuck in your teeth. But the tender, moist and densely-banana flavored cake within is a gem, and would be a great swap in any layer cake, coated with cream cheese frosting or dark chocolate and coffee ganache. In fact, I can’t wait to make it again exactly like that. But for the love of all that is bathing suit season, I hope to find a better excuse than “It was Sunday, and the bananas called to me!” No, it will at least be Monday. If the caramel topping is still calling to you, despite my warnings that it is terrifically sweet and hardens once set, just be sure to serve it warm, before it does. A few other adjustments: the original recipe calls for an 8-inch cake pan, which is an absolute no-no. Mine completely filled a 9-inch pan with 2-inch sides. If you are nervous or don’t have at least 2-inch sides on your 9-inch baking pan, go for a 10-inch pan instead. Finally, I don’t know if my oven temperature is wonk or not, but this cake baked in 40 to 45 minutes in my oven, not 55+, something I have adjusted below. For topping: Spray 9-inch round cake pan with 2-inch-high sides with nonstick spray. Bring butter, sugar, and corn syrup to boil in medium saucepan, stirring constantly until butter melts. Boil syrup 1 minute. Stir in nuts. 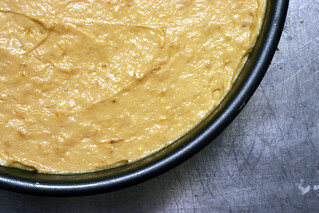 Spread topping in prepared pan. Let topping cool completely. For cake: Preheat oven to 350°F. Sift first 4 ingredients into medium bowl. Using electric mixer, beat butter and both sugars in large bowl until blended. Beat in eggs 1 at a time, then mashed bananas, sour cream, rum, and vanilla. Beat in dry ingredients in 2 additions just until combined. Spoon batter into pan. Bake cake until tester inserted into center comes out clean, about 40 to 45 minutes. Cool 15 minutes. Cut around cake. Place platter over pan. Holding pan and platter together, turn over. Let stand 5 minutes, then gently lift off pan. Cool at least 15 minutes for topping to set. Serve warm or at room temperature with whipped cream or vanilla ice cream. I love the idea of a banana cake topped with a mocha-style ganache. Pralines have their place, but to me its not on cake. The photo is wonderful, as always! I am glad you tried this recipe. I was also hesitant about the caramel walnut topping. I love the combination of sour cream with the bananas in the cake. I bet it was moist and delicious! I must have missed this one… I’m a little attached to all recipes that are banana too. Yummy cakes… breads… etc….you did this one good! that caramel topping looks just incredible, but that’s such a good call on the hardening! i’m not sure i’d like it as much with a crunchy top. and bananas are one of the best baking staples — yum! The caramel is calling me like a lost loon. I wonder if there is any way to make it so it doesn’t set like cement. Thanks so much for the advice on the caramel. I think I will make the cake and then top it with something lighter! I’ve been looking for an alternative to my default banana bread recipe and this might fit the bill. Per your recommendations, I’ll probably skip the caramel topping, because I love me some cream cheese frosting. Yum!! God, this sounds marvellous – sans caramel. I am discovering that the older I get the plainer I like my cake. This bothers me. This cake looks like a serious problem. I’m a sucker for banana. It gets me every time. And how could you go wrong with banana and caramel?…. well I guess it’s possible. I think I’ll try the banana cake by itself, the run and sour cream must make and incredible cake! I remember seeing that recipe and going through that exact thought process. And I wondered about the caramel too (which is pretty much the sole reason why I haven’t already eaten half of a carmel walnut upside down banana cake), so thanks for the heads up on that. For gooey goodness sake, this cake is calling to me, whispering about sugary deliciousness and yelling about banana flavor. And the crumb that the sour cream produces… While I’m normally in the plain-cake camp, I have a sneaking suspicion that the carmel-walnut topping might become a regular problem at my house if I dare to make this. If anyone is looking for a classic banana bread with spices and a wee nip of bourbon, not to toot my own horn, but I definitely vote for you trying the one in the archives. Someone tried it recently with browned butter and it looked like heaven! As for the caramel, cream is usually added in the end to keep is soft, a la the caramel cake. I haven’t tried this with that kind of caramel, so I can’t assure it would work, but if you’re enterprising, give it a shot. And definitely let us know if it works! looks delish as always! i am not an Ã¼ber-sweets lady, but i do find myself with more brown bananas than i would like to admit! Yum! I love upside down cakes. No worries about trying to frost them or top them. They look so plain when you take them out of the oven, but then you turn them out of the pan and voila! perfection. I would like to eat this for breakfast. 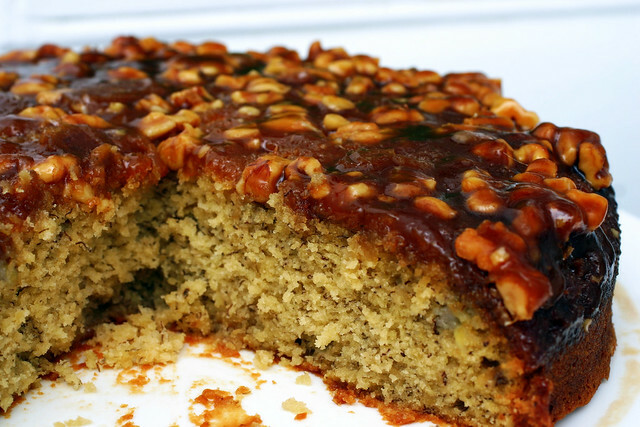 i absolutely love banana cake (it was a big hit when I was a kid at camp) and you just took it over the top with those caramels and walnuts. i’ll put it in my queue…maybe right at the top. i think it deserves the top spot. I admit I did have reservations when I saw that caramel topping. The thing is, it looks so fabulous! Maybe a butter and brown sugar crumb topping would be good. Like eating a banana nut muffin. Streusel is a great idea! I bet the one from the Big Crumb Coffee Cake would be delightful with this. I don’t know how I feel about this one, Deb…It looks beautiful, but I think I’d just stick with your jacked-up banana bread recipe, which is always amazing and certainly not scary sweet. :) Still, bEEutiful cake! Hmmm…if I changed the walnuts for another nut, my hubby might crawl on his belly for this one. I recall a similar topping on the old style Beehive Cake. Could it be the corn syrup that causes it to harden ? I’m going to actually attempt this tonight and yes, it is def the corn syrup. I haven’t decided but I’m either going to: 1) making topping separately and serve with the cake after it bakes or 2) omit the corn syrup and just use reg brown sugar with a little molasses drizzled before adding the batter. Looks wonderful!!! The caramel is inspirational. Re: the cream. Do you think a mere tablespoon or two immediately before spreading in the prepared pan to cool would suffice? Deb, I’ve said it before but feel compelled to reiterate: you ROCK. Thank you so much for the service you provide, it’s greatly appreciated. I’m sure the opportunity will present itself that I need to make this cake also. I better get to the grocery! I don’t think I could get down with the stuck in my teeth layer, but you already had me with ‘banana.’ Looks so scrumptious! Oh, you just hit a nerve. Or several nerves. I can smell it from here, this looks incredible!! It’s definitely an adult version of banana bread. Thanks! i suspect the difference in baking time is the size of the pan. 8 inches is smaller (duh) and theoretically speaking it would be thicker than the 9 inch pan.. yes, the 2 inch height is still there but the overall surface area is different, more of it is exposed to the heat. Another factor could be the eggs and the butter and how much air was incorporated.. Ive learned this with the gazillions of cupcakes ive made..
My mouth is watering looking at that pic. Does anyone, maybe you Krissy (? ), have a great cream cheese icing recipe? Thanks. That sounds amazing! Too bad the topping is so sweet, because it looks lovely on the cake. I’m thinking of making it with the walnuts incorporated into the cake, and a bittersweet chocolate topping. whoa this is so intense. it looks beautiful. it’s like pecan pie (a la walnut) and banana bread’s love child. these are my boyfriend’s two favorite american treats (he’s a britter) so i shall have to make this for his birthday next month! eating the cake when the caramel is still soft and warm shouldn’t be a problem as i’m sure people will be very enthusiastic to tuck in! My guys have been begging for a banana layer cake but they eat all the bananas. I’ll show them this one and just maybe they will leave a few on the counter. Maybe replace most of the corn syrup in the topping with a Tb or two of cream and a squirt of lemon juice? Boil the butter, sugar, and lemon, then add the cream when you turn off the heat. The cream should keep it a little softer, while a little lemon goes a long way to cutting the screaming sugars in caramel. Oh, Deb. Why do you keep doing this to us? But then, we DO keep masochistically coming back for more, again and again, don’t we? I agree with Kate – the wonderful banana cake with walnuts and a bittersweet (or dare we go dark?) chocolate icing sound perfect. (At the risk of sounding a bit like Elvis, the only thing missing in this is possibly a peanut butter element) I actually imagined this cake, if not with the caramel or chocolate top, with the wonderfully-intoxicating, completely soft soaking of a Bacardi rum glaze. That really couldn’t be a bad thing. Could it? seriously how will i loose weight if you keep posting such recipes!!! because now i will have to make this and then eat it :(…it looks SOOOO yummy. I’ve made this too! It was awesome! If somebody comes up with a good chocolate or cream cheese frosting for this, please post it! I have very ripe bananas to use this weekend! Lola — The coffee granules (I use instant expresso, actually), if doubled, could give it a real coffee kick. Here is a cream cheese frosting: https://smittenkitchen.com/2007/09/red-velvet-cake/ You will probably only need half of that amount. Some people found the 3 cups of sugar a bit sweet, so you might consider starting with two cups, and adding more if you think it needs it. This cake has a beautiful ganache-like frosting which firms up well in the fridge. Halve the recipe for one cake layer. you are KILLING ME. and yet, you are also strangely prescient, because i happen to have 4 over-ripe bananas waiting to be folded into a baked good AND bananas and walnets are 2 of my partners favorite things AND as he won last weekend’s scrabble tournament i have to bake him the promised prize cake. and i will make this cake, and then i will try not to plunge my face directly into it and eat it, which is what i want to do to the picture on the screen but i know it won’t work. Yeah, cream cheese frosting or a chocolate ganache would be my preference for a topping. I can only picture the sugar getting stuck on my teeth or cracking a tooth and having to visit the dentist after a slice of yours!!!!!!!!!!! This looks AMAZING! Thanks for the recipe, although I’m sure anything I make won’t be as beautiful as yours! Too bad the carmel became hard. It looks so good! Has anyone ever tried the Banana Butterfinger cake in june 93 bon appetit. frosting and crushed butterfingers around the sides of the cake. Love your site and your pictures, thanks for all the work you put into it. I, too, have loads of ripe bananas at my house right now… sigh… I make a caramel french toast (which is baked) that has a similar caramel sauce that goes in the pan first. I have found that not boiling the caramel mixture for so long (just make sure the sugar is melted) keeps it from hardening too quickly…And adding a little cream is a terrific idea. Although if it isn’t sticky-sweet, it can’t be caramel, right?! This would be the perfect cake for my daughter’s birthday party!!! She loves chocolate and there’s a reason we call her the monkey. I’m so excited!!!! I’m going to try it with the chocolate ganache you referenced and then pipe dainty little butterflies on top to go with her butterfly theme. Bebba, thank you! I make the same caramel French toast and sometimes my caramel comes out hard, sometimes soft. We prefer the soft for the dental work-removing reasons cited earlier. You may want to try something I do. I like to put pecan halves in the caramel after I pour it into the pan (flat side up, so the “pretty” side shows when you invert the piece of French toast onto the plate) before the bread and egg-milk mixture. Glad to know what makes the caramel soft vs. hard. Guess I should have known that, huh? OMG show stopper there! Okay I’m adding this to my list. OMG that looks so good. I need to pick up some rum. Lucky me, I cleaned out my deep freezer, and I found my bags of over ripe bananas. Just enough bananas for 3 cakes! The cake came out perfect!! I made it in a 9″, w/o the caramel, but instead added the walnut halves to the batter. Perfect. In less than a few hours, half the cake was devoured by everyone in and out of the house. No frosting needed, it was excellent (made with Meyer’s Rum). Looking forward to having another piece for breakfast! Thanks. I love banana cake as well. I make the banana cake from the Cake bible, and make a caramel frosting, so you get the caramel taste without out the shellacking issues. ohmygod. this might just be the cake am looking for for my beloved grandma’s birthday coming up. i might turn it into cupcakes though, thanks! Oh. my. gosh. This looks so good. My favorite banana cake/bread is from the Jan. 2008 issue of Gourmet. It has a layer of chocolate and walnuts in the middle, plus more on top (like a streusel). I just happen to have some very ripe bananas hanging around my kitchen. I adore caramel, so crowns or no crowns I am taking a risk on the topping. Hi! I recently discovered your blog, and out of all the food blogs I’ve read (and that’s A LOT), yours is by FAR my favorite. I basically spent a few days at work doing nothing but going through your old posts. You have inspired me to really step up the level of photography on my OWN blog! (Although the amount of beautiful, natural light in your house could never be achieved in my garden [read: basement] apartment.) Thanks for a great blog! I am going to go into a sugar coma just reading this blog! :) I have made at least 3 dishes off this site in the last week. That is how long I have been reading. But I went back to 2006 and have been looking at all the wonderful things. Thanks for the fun food. What is this divine chunk of heavenly banana goodness!!!?? I’m drooling right now, and I’m at the office, so thanks a lot! That’s so funny, I made this for Easter Sunday and had almost the exact same experience. I only had a 9inch pan so it was the same size as well. Delicious however by the time it had cooled and we went to cut it I almost needed a serated knife to get through the topping and edges. My husband said that the crunchy chewy caramel with nuts was his favourite part. This cake looks marvelous. I have a whole bag of pecans at hand, so maybe I’ll use those. Now it’s on my list to “Cook This”! Ok, so I have a question for you!!! Everything is beautiful and absolutely scrumptious. However, how do you bake all this bountiful beauty and still stay slim? Just a note: I went ahead and added two tablespoons of 10% cream off the heat just before pouring the caramel into the cake pan to cool. It worked wonders! It’s still like a caramel, but I’m not picking it out of my teeth for an hour afterward; it sets, but not like concrete. So I made this for easter. In two 9″ pans like you suggested (I measured them). They came out wee-bitty. I mean, the cake was less than 1 inch high (i measured that too. It was so short that i have to ask – is this recipe you provided for one pan? I cannot believe you posted this! I made this about 2 weeks ago! I used pecans instead of hazelnuts. I had a few problems with mine… the main one being I made it all in one pan and had a MAJOR spill over! Your cake looks amazing! It makes me want to try again! Melissa — I don’t think I suggested two 9-inch pans. It *just fits* however in a 9-inch with 2-inch sides. I’m making this with a butter rum glaze to take to work this week end; absolutely love this site, thanks for another great recipe! Am I the only one who reads such a wonderfully named recipe and immediately expects to be letdown by the final product. I mean, there has to be a point of diminishing return where good+good+good stops equaling better. I can’t even think of anything else that could be added to this cake, except maybe coffee. Or money. Oooh, YUM. I made this cake this weekend, sans the caramel and with the addition of grated ginger and dark chocolate chips. Hello?! I will never bake banana bread again (bb gives me a hard time with the dry edges and goopy middle). It was SO good, and easy peasy. I did it in 2 8-inch pans for a layer cake (I know, nothing in between, but who cares?) without any problem. im so glad i came across this post. i actually printed this rebipe to make sometime this month. 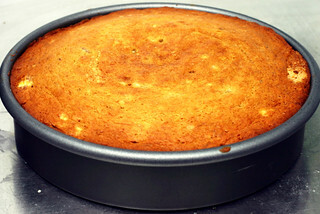 i was was goilg to make the banana cake as a layer cake and skip the topping. your review makes me think i made the right dechsion. also does anyone know how much batter this makes? bananas and butter-sugar goo! what’s not to love?! Yummy! Deliciousness + saving bananas from extinction = always a good recipe in my book. If you were to frost between the layers and on top with very lightly sweetened whipped cream; the caramel topping would not harden. It is soft and delicious! 1. I baked mine in a 9-inch spring-form pan, and it worked out perfectly! It was just the right size, and it made the removal of the pan a cinch. Definitely follow the advice and Do Not use an 8-inch pan. 2. Deb, you mentioned that the cake tasted a bit too sweet for your liking. Well, I’m just like you: I don’t like overly sweet desserts. So, I used salted butter for both the topping and the cake, and it was Perfect! It gave the topping a nice, almost salted-caramel flavor, which I LOVE. Fair warning though: my husband, who likes his desserts painfully, tooth-achingly sweet, felt like the dessert wasn’t sweet enough. It looks so good! That’s too bad about the caramel topping hardening. I just made this cake, but without the caramel topping. I instead used a chocolate ganche. And can I just say, it was killer. I made it for my Mom’s birthday and it was gone before I could blink. I made this cake yesterday and switched the topping to chocolate ganache, with a hint of coffee. It was very good BUT very small in height. I didn’t have a 8 inch pan so I bought a 9 inch but could only find a square one. I came home and made the recipe using just one pan and it came out an inch in height! Thankfully I had enough ingredients and went and made a second one and turned it into a layer cake. I think I baked it a bit too long as it was denser than I had hoped. My question is, is there more surface space on a square 9inch than a round? It appear that way. Still it is good enough for breakfast this morning. The base area of a 9-inch round is 63ish inches; of a 9-inch square, it is 81 inches — so yes, that would do it! That looks so good. I especially mean the caramel-nut ooze. Couldn’t “we” come up with a use for the caramel lid, like should we make it on its own and break it up on top of vanilla ice cream? Should we? If I do, I’ll be back to report on results. Hmmm, a little dinner do this weekend. Need to make dessert. Hmmmm…. I made this once as an 8″ cake (plus one mini too) with cream cheese frosting instead of the caramel. It was the best reason to “forget” bananas I’ve ever tried! Today, I made cupcakes and they were perfection too. I used an ice cream scoop which made 16 and they took about 25 minutes to bake. Thanks Deb! You are always my first stop when looking for great new recipes! I made two of these in one week a few months ago. I am currently making two more. I absolutely love this recipe. it is sweet, but i think that keeps you from eating more then one slice at a time (good diet plan!). rave reviews from everyone always it seems! i cannot wait to cut into the extra one i just baked! use heated dulce de leche instead for the caramel topping, it wont harden and is so delicious with bananas and nuts! I adapted a topping from Sara Moulton like so: 1/2 c butter, 1/2 c brown sugar, pinch salt, simmered together 4 minutes on stovetop. Poured into cake pan and then sliced raw bananas onto sugar mixture, scattered toasted walnuts among bananas. Then poured cake batter onto it. Also, sprinkling some additional raw rum (maybe 2 Tb) over finished cake before turning out of pan. You can make a lovely pattern of bananas that look great when the finished cake is turned out, by designing long, curved pieces of bananas sliced in half with round pieces of banana sliced into “coins”. I’ve made this several times by this method and the double-whammy of bananas both in and on the cake gets raves every time. This has become a Go-To for me when I need a quick cake. Thanks so much for the original and the inspiration it brought me! Heed warning for the larger pan size! I read all the comments regarding pan size; 9″, round, or square, etc. Between the 10″ square or the 8.5 ” round I had, I went with the round. The caramel bubbled up the sides during the baking. What mess, and the smoke! The cake was fantastic as I did add cream to the caramel so it wouldn’t harden. I definitely will try this again…with a bigger pan. I took your advise and did not make the topping, instead I made your incredible easy butterscotch sauce and a simple topping of greek yogurt, honey, zest, juice and nutmeg and the whole combination was spectacular. Your site is a must! This weekend I will go for the Honey Cake. What a great recipe!! I just tried it last night and served it today. Followed the recipe exactly and it turned out wonderfully!! Thanks! OMGersh!!! There goes my diet just looking at the photos! My boyfriend is desperate for something peanut butter AND banana (with just a touch of chocolate)….what do you think about this cake in place of the chocolate cake on your “chocolate peanut butter cake from Aug 11, 2009? If you don’t like this combo can you recommend a better one! LOVE your site!!! mmmm so delicious on a cold, wet,rainy day! made my darling daughter very happy! we replaced rum for amaretto and carried a delicious almondy nuttiness into the cake! I made this cake today, and within a couple of hours it was 2/3rds gone. There’s only 5 of us eating it. I left off the sweet topping and opted for adding chocolate chips–YUM! I strongly recommend this. A great alternative use of aging bananas! I know this is a bit late, but I’ve done this cake twice and it’s lovely, even with the topping scrapped out of the pan and pressed on top. Just made this cake today…. Did NOT use caramel topping, baked in 9” round pan. Topped with David Lebovitz’s easy chocolate frosting (melted chocolate and water, add butter off heat, cool)…. I found this while doing a recipe search for banana upside down cake, and since I was serving it as a coffee cake in the morning I didn’t want it to be too sweet. I took Maggie’s suggestion for a more typical upside down cake topping (from the January 7, 2010 comment above) but halved the amount of sugar/butter mixture she used and dropped the sugar in the cake to a total of 3/4 cup. I also took her suggestion to make a spiral of bananas sliced the long way with “coins” to fill in between, and I used a 9 inch springform cake pan with a parchment collar I didn’t end up needing. I may also have made up for a shortfall in mashed banana with extra sour cream, and for a lack of rum with somewhat more bourbon. Ahem. It came out with light glaze of banana-y caramel slicking the top, and more delicately crumbed than I’d thought a banana cake could be. Totally happy with this one. I’d love to make this tomorrow night, but I’m baking for someone with a nut allergy. 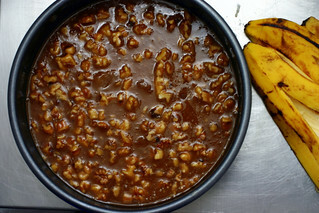 Do you have a good recommendation for substituting something for the walnuts? I was thinking a nut-free granola, but thought you might have a good suggestions. You could probably skip the nuts entirely and still have wonderful flavor. Could this possibly be made ahead and frozen/fridge’d? Also, how long do you think it would keep at room temperature? I made this (without the caramel topping) and the jacked up banana bread last Thursday and they were both ABSOLUTELY wonderful!!!! I may have missed it but I looked in FAQs and a few other recipes. Do you list the # of servings for recipes somewhere?? I am gathering a few of your fun summer recipes to take for a family vacation where I will have to probably double or triple the recipes for all the folks. Taylor — I don’t usually list serving sizes on cakes because it varies wildly. A caterer might tell you that you’d only get 8 slices from a 9-inch round but I know few people who eat full servings of cake. Usually people want slim slices, in which case you’d get 12 to 16.
just made the banana caramel cake with a few additions that I learned from America’s Test Kitchen..I also added a few tablespoons of heavy cream to the caramel topping as it came off heat and the caramel topping stayed very soft..even after several hours at room temperature. This is a delicious cake. Thanks for sharing all of your recipes and knowledge with us. Can’t wait to buy your book! This cake is fantastic! I’ve adapted it a little for my family’s purposes, I add about 100g chopped dark chocolate, leave out the caramel, and use maple cream cheese frosting (from your carrot cake recipe). It’s delicious! I’ve just baked it for the third time in the last few months for family birthdays. THANK YOU SO MUCH. This was, without a doubt, the best banana cake I have ever eaten. I skipped the topping, though (thanks for the warning) and put chocolate on top instead and it tasted delicious. I also only put it in the oven for 30 minutes, which meant that it was still kind of moist inside, but when it cooled off, it was exactly right (and not too soft at all!). LOVED this! I appreciated your warning about the cake + topping being overly sweet. I was, however, unwilling to give up that delicious looking topping… so I cut the 1/2 c of sugar from the cake recipe, and only used the 1/2 c of brown sugar. I added a couple pinches of salt to the topping to cut the sweetness and used less Karo syrup (about 1/3 of what the recipe calls for), which I think kept the topping from getting hard, because mine remained soft and gooey. I somehow missed your jacked up banana bread recipe. Def trying that one soon! Made this tonight, topped it with a thin layer of cream cheese icing and chopped walnuts. Divine! The cake is light and fluffy and lovely….look forward to trying a different topping next time! Thank you. Sounded yummy. I cut the topping recipe in half. You’re right about the topping taking over the cake. It was hard to cut through. I’m using the cake recipe again for cupcakes and will be putting on a cream cheese and pecan topping. What if you used the new non-stick tin foil to line your pan and left it in the pan for a day and flipped onto a plate the next day? I want to make this on a Thursday for a Saturday and I’m trying to figure out the best approach to have it keep till then without too much drama. Hi EB — I’ve never used the stuff so can’t say for sure whether it will work. But my bigger concern would be that the caramel will firm up and then not pour over the sides like a good upside-down cake once cool. It would be worth it to return the cake to the oven for a few minutes to warm/loosen the caramel up again before flipping it the day you serve it. I tried this recipe but I borrowed someone’s idea to make the caramel into a frosting. Mine did not come out very good. I’m not sure if it’s because I used dark brown sugar or what happened but the caramel frosting wasn’t good. We ended up just eating the cake without anything else and it was delicious just on it’s own. It’s almost like banana bread except more moist. Well, I love this recipe, but no matter what I do I always do something dumb and it fails. Last time I didn’t let it cook all the way, so I had to hollow out the middle and have a faux bundt cake. This time I poured the topping into the pan and though “Oh the whole cake won’t fit in that” and preceded to pour it into a spring form pan. Which leaked all the sauce out onto the cookie sheet I placed under it…in the idea it may overflow. I am going to try and remake the sauce and pour it over the top now after letting it boil for a bit. All I want it to make this thing without making any little stupid mistakes. It’s my Everest. Which is sad, cause it really ain’t that tough. I never had a chance to make this until today when my friend discovered he left his grocery in the car overnight, and he’s not going to eat the frozen bunch of bananas, which lead to me making this. O. M. G. As it was baking, the smell of milky caramel filled every room of my small apartment. When I took it out, the caramel was bubbling around the edges. I can’t take it anymore. I start eating it even before the caramel stopped bubbling, and by the time I flipped it over, it’s 1/4 gone. *cough* anyways, maple syrup is a splendid substitute for corn syrup; Brandy is excellent substitute for rum; I used dark brown sugar instead of golden and it was fine, if a tad sweet; You can use coconut oil instead of butter HOWEVER, try 1/3c coconut oil for the 1/2c of butter. If you do 1/2c of coconut oil, you will get a heavier oily cake (that is still irrisistable with super tasty caramel and banana flavor). This is my new favourite banana cake recipe…because its so much more than a banana cake! 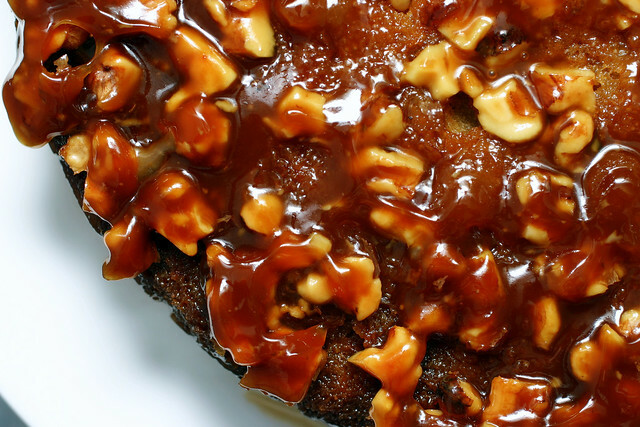 The caramel topping is chewy, sticky and incredible. The cake was extremely moist and delicious. Baking in Australia, we don’t tend to use dark corn syrup, so i substituted golden syrup in the topping and it worked beautifully. if you are looking for that praline-type topping without all the hardening – THIS IS IT!!! Can be used on any cake – white, vanilla, chocolate, — and now I will try it on banana! Thanks for the cake recipe!! Broil for a few minutes until bubbling. Watch carefully!! From my childhood – thanks Mom!! This cake, sans caramel topping, is baking in my oven right now. I had leftover bananas ( which looked more browny skin than the picture, but still hadn’t fallen into rot yet, just excellently smashable), and a 4-year old with a head cold to cheer up. I have high hopes this will do the job. Thanks, Deb. Your blog is my favorite go-to for delicious and do-able. I recently made this cake and it was absolutely lovely. 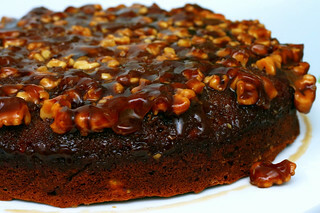 The caramel was sweet and soft and the walnuts added an excellent touch of flavor. If I had one complaint, it would be that the banana flavor of my cake did not come through quite enough, but overall this was really delicious and definitely something I’d made again. Thanks! I was warned about the caramel, but I proceeded anyway. I didn’t have any cream on hand to try and keep it soft, and even now, just twenty minutes out of the oven, it’s hardening to an amazing degree! No matter. Delicious. I used my cast iron dutch oven, if anyone’s curious. I was almost going to make the butterscotch sauce separately, or even the cream cheese maple frosting but no, I so badly wanted the shiny crunchy toffee glaze I didn’t heed any warnings about the sweetness, or the hardness and went ahead. Was worried the sugar wasn’t dissolving properly for the toffee, but by the time i poured it in the pan (9″ spring form was all i had) it looked ok. After 40 mins, cake was ready, edges of the toffee had started to bubble up the sides, looked promising. But when I turned the cake out the edges of the toffee seemed they had gotten hot enough but the centre was all crumbly, didn’t come away from the tin easily and was basically like lumps of brown sugar and nuts… so I put the cake back under the grill, so the toffee would bubble up and dissolve a little which kind of worked, but the nuts also got quite brown. In the mean time – the cake has shrunk to about1.5 inches high :( MY house smells amazing though! Maybe i’ll make a new one and revert to maple cream cheese frosting tomorrow. The “Surprise Me!” feature is so much fun! Found this through it and it looks amazing! Hello! I’m not sure if this is a ridiculously silly question, but am I able to just use regular flour instead of cake flour? This looks perfect for sharing at work! Would this work as small cupcakes instead? Heather — Regular flour should be just fine. I haven’t made these as cupcakes but it looks like Kim in #94 did. What a wonderful recipe! Please tell me what I can substitute corn syrup with as it is not readily available. Hi Deb, I made the recipe exactly as you wrote it (and same pan size) but substituted all-purpose for cake flour. I’m sure it’s gonna be great when it’s done, but the pan is absolutely overflowing all over my oven (the burnt sugar smell in the house has everyone drooling, though, which is a plus). Do you think the flour substitution could’ve been the reason? This looks amazing! Do you have any replacement suggestions for the sour cream to make this dairy free (I’m going to use margarine in place of the butter). You could use a non-dairy yogurt or I suppose a nondairy milk. Might be less creamy but otherwise fine. I made this last night with the caramel topping, and I gotta say, I was feeeeeeling myself. It was delicious, albeit sweet, and a small slice paired perfectly with a cup of tea. This looks SO good! When you say to swap the caramel topping for a chocolate+coffee ganache, you mean to just bake the cake normally and add the ganache at the end? do you think I can still have the walnuts at the bottom of the cake? Can you make and assemble the batter the day before and then bake it the next day? I make a lemon almond cake that has a almond honey thyme caramel topping. In this case, the topping is boiled on the stove for a short time them poured over the cake on the final few minutes. (It has cream too so not overly sweet). Easy to make. I was worried about the nuts burning or sticking but there was no problem when following directions. It is sweet but well textured. The cake itself was awsome. Perfect as is. I did not make this topping, but tried the butter/brown sugar that another reviewer (Maggie) mentoned. It was also sweet, but slightly grainy, but good. I sliced bananas for a design on top and sprinkled toasted pecans. Flipped over and it looked lovely while warm, until I refrigerated it..then the brown sugar solidified a bit and didn’t have the nice translucent look. Warmed it up and tasted great. I used a high sided dark springform pan .. i think it was 9 inch. definitely needed the higher sides. Can I use a bundt pan? This looks divine. Is there a substitute for the dark rum?